Coming from a dark past, Gambit has not always been a hero. 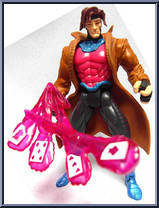 Once a member of a guild of thieves, Gambit gave up the quest for gold to become a member of the X-Men. With the mutant ability to charge objects with energy, this ragin' Cajun can create a weapon out of virtually anything! With a love of Cajun cooking matched only by his bond with teammate Rogue, Gambit has earned a trusted place with the X-Men!